If you had a Sega game system in the early 90’s, chances are you will have owned, played, or at least heard of Streets of Rage. For those of you that haven’t, it was a side-scrolling beat-em-up, and it was legendary. You may approach Streets of Rogue thinking that it is some sort of remake of that classic game. It’s not. The “tutorial” – pretty basic, but that’s all you need! 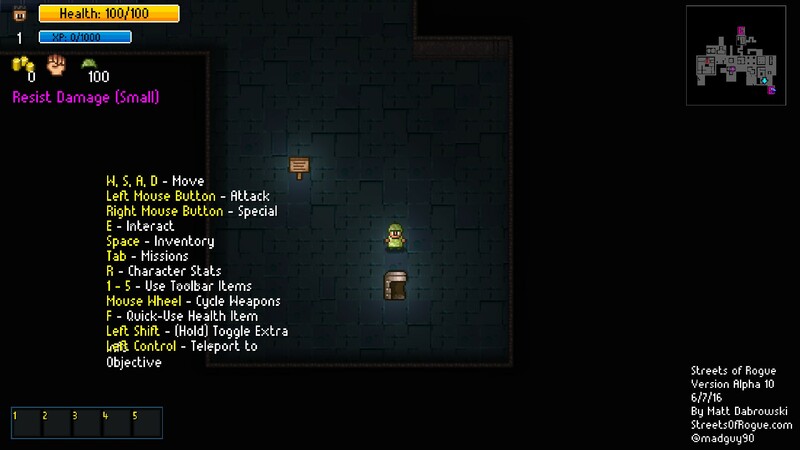 …and Streets of Rogue ticks every one of those boxes, apart from the turn-based one. Instead, this game plays more like a twin-stick shooter – the player controls their character with the classic WASD and mouse combo that we PC gamers have come to know and love. Left-click attacks, holding right-click does a special attack, interact with E – all standard fare. What’s not standard though is the way the game progresses you from level to level. Firstly the levels are totally random, which means that it’s never the same experience when you come to replay the game. Then there are the missions… There are always 3 missions to complete in order to unlock the elevator to the next level, but the player can accomplish them in a variety of ways, depending on their selected character and the abilities that character brings. A simple example is this: Let’s say you want to get through a locked door. If you are the Soldier, you can place an explosive charge on the door and, boom – it’s open. If you’re the Hacker though, you could tap into the computer inside the building and get that to unlock the door for you. If you’re the thief you have an ability that allows you to walk through walls. There are lots and lots and lots of ways that the player can tackle a problem. 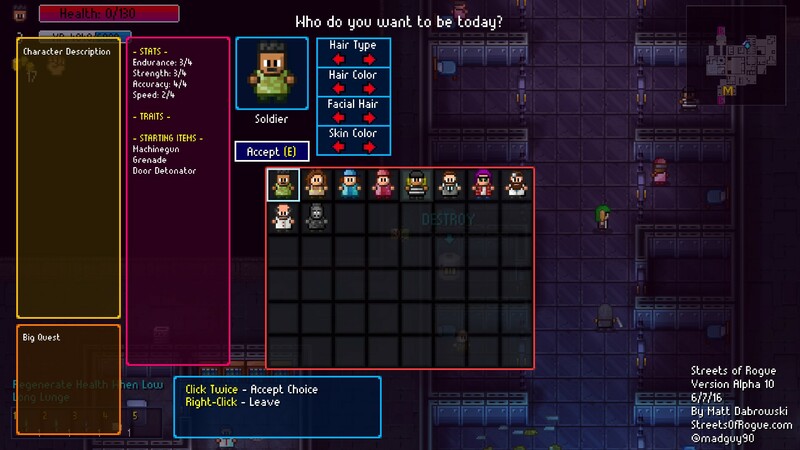 There are currently 10 characters in the game, all with interesting and varied skills and traits. I rather like the Gorilla, who can’t talk and is attacked by scientists on sight, but can take a lot of damage and punches really hard – there’s something oddly satisfying about punching people through walls… As you level up, so you unlock new skills – sadly though these are lost as soon as you die, which is a bit of a shame as I think that it could improve the players desire to replay the game with the same character. At the moment there’s no real difference between starting a new game and replaying the current one. It would be good to see something that could be carried over from one gaming session to the next, be it in the form of unlocked items, skills, or characters – all things that could be added by the developer in future releases. The graphics are pixel-based and fairly cutesy, but suit the game well. There are some nice effects for explosions and the like, but it’s the lighting that steals the show for me. This game is very nicely lit – it somehow manages to be colourful without being too gaudy. There are some great subtleties too that I really appreciate, like how the light spills into a room when the player opens a door. The sound effects are great. Nice and meaty, especially the one for exploding bodies – I really like that one! There’s no music in the game as of yet, but when it gets added I imagine that the overall atmosphere is going to be dramatically improved. This game is a lot of fun. It doesn’t try to be too serious, but there’s still a lot of depth to it. Unfortunately there is no main storyline yet, though there are placeholders that hint at the upcoming inclusion of one and it’ll be great to see that added as I think it will tie the whole thing together. Apart from the lack of any carried-over experience or items, the replayability factor is high – it’s basically designed to be played over and over again, with the player experimenting with different characters and abilities. Overall Streets of Rogue is a perfectly playable alpha, I unearthed no horrible glitches or game-breaking bugs. It ran smooth on my system, worked pretty well with my new Steam Controller, and was generally a hoot to play! I’ll be keeping my eye on the development of the game, and look forward to seeing it progress towards its completion. These fools want to pick a fight with a gorilla!